(CNN) -- American Jason Dufner carded a nine-under-par round of 63 to move to the top of the Canadian Open leaderboard, but it was Mark Calcavecchia who was in record-breaking form at the Glen Abbey Golf Club in Oakville. 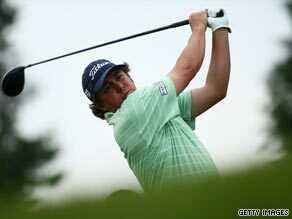 Dufner holds a one-stroke Canadian Open lead after a second round nine-under-par 63. Heavy rain and lightning on Friday meant the whole field needed to complete their second rounds on Saturday and it was Dufner who fared the best as he moved on to 13-under. It could have been even better for the 32-year-old, who has never won a PGA Tour title, but he bogeyed the 17th having previously racked up eight birdies and an eagle. "I played very well, hit a lot of fairways, a lot of greens," Dufner told reporters. "It started raining at the end, conditions got a little tougher, but 63 is a pretty good score, and leading after two rounds is always great." All of the players were able to complete their second rounds, but the heavy rain set in once more forcing the postponement of the third round until Sunday. Tour officials are hoping the weather will be more favorable then and allow 36 holes to be played. Jerry Kelly and Scott Verplank are one behind Dufner on 12-under after both fired 67s while Australia's Nathan Green, who scored a 65 in the second round, and American Peter Tomasulo on 11-under-par. A group of six players are three off the pace, including Colombia's Camilo Villegas, South African Retief Goosen and Scot Martin Laird. Meanwhile, Calcavecchia, who began his second round on the back nine, was tied for 17th on eight-under-par after his 65, which included nine consecutive birdies from the 12th hole to the second -- a PGA Tour record. That took the American to 10-under-par but the gloss was taken off his achievement slightly by bogeys at the fourth and eighth. Anthony Kim is usefully poised on nine-under while England's Luke Donald, who finished tied fifth at the British Open last weekend, comfortably made the cut on four-under-par. John Daly, however, was among those to miss out, the colorful American struggling to a level-par 72 to finish on five-over-par.